Call today for fast tree removal services! Are you looking for a reliable tree service in the Albany, NY area? Do you have a dangerous tree in your yard and require tree removal? Mark's Tree Service is dedicated to providing the finest in tree removal and tree trimming service. We want to assure you and your family is safe when they go outside. In the market for seasoned firewood? We have that too! give us a call today to learn more about our services. When you look out the window and take stock of your yard, what do you see? If you notice bent and broken tree limbs or trees that aren't going to survive much longer, it's time to do something about it. Do you have that same old tree stump that you've been meaning to take care of for years? We can take care of that for you in no time! If you think it's time to spruce up your yard, call Mark's Tree Service! We're here to help! Mark’s Tree Service is a family owned and operated business out of Albany, NY that has proudly served customers across the Capital Region for more than 25 years. We run our business on the values of personal service, fair prices and outstanding results. We take pride in the customer satisfaction that we earn, every step of the way. As a professional tree removal company, we offer only the best and most comprehensive tree services to the Albany, NY area. Whether you need tree trimming to clean up your property or seasoned firewood to be ready-to-go for summer bonfires, choose Mark's Tree Service! Providing Safe, Reliable Tree Trimming Service! You can count on us to always offer friendly, personable and professional services. When we come to your home or business, we always offer free estimates. We’ll tell you what to expect, and you’ll be pleasantly surprised at our reasonable rates. You can rest assured that our company is fully insured, something of major importance in this business. We also have the most modern radio communication system around used between our crews. This gives us the benefits of faster, more efficient service for you, and safer conditions for our crew members. We are pleased to offer all the services listed below. Keep in mind, if there is a service you are interested in that’s not listed below, please contact us – we will gladly talk to you about any tree services! As the premier tree removal and tree trimming service, we strive to provide the finest services the Albany, NY area has to offer. The next time you are in need of tree service, give the professionals at Mark's Tree Service a call. Have you recently noticed a hanging, broken branch on your property? Are tree roots making their way into your basement? There are a variety of reasons why you may need tree removal, but there is only one company you should call for the job. 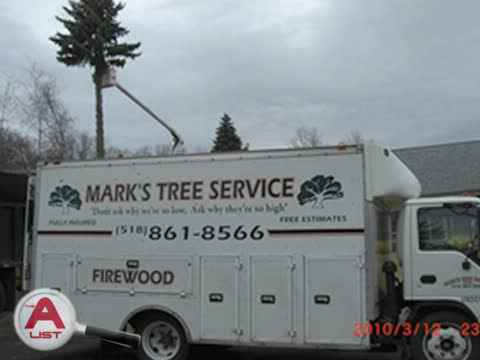 Mark's Tree Service is comprised of professionals who really know what they are doing. We can provide you with safe tree removal service that not only rid you of the problem tree, but keeps you and our workers safe in the process. For more information about tree removal or for a quote, call us today! If you are looking for reliable tree care, we have you covered. We serve residential and commercial clients with comprehensive tree services, including tree removal, tree trimming, pruning, stump removal, and more. Our experienced staff will arrive on time to help you with your urgent tree needs. We extend our services to customers in Albany, NY and all of the surrounding areas. If you need tree removal or more information about our other services, contact us. At Mark’s Tree Service, we provide top quality seasoned firewood for those who love campy or enjoy a backyard fire. We offer great rates as well as special offer for senior citizens. Be sure to check in with us during the off-season for excellent discount. We look forward to providing quality seasoned fire wood to the Albany, NY area! We offer a wide range of tree services for both residential and commercial customers in Albany, NY. We can handle all types of tree work in order to meet your needs. From tree trimming and removal to selling seasoned firewood, we have you covered. When it comes to sourcing superior firewood, clients from all across the area come to us. Our firewood supplies are sold at the best prices that you can find. Contact us today for seasoned firewood. Whether you are looking for professional tree removal, tree trimming, or looking to get seasoned firewood, Mark's Tree Service has it all. Our services are unmatched to the competition. If you are looking into tree service, give us a call today! Mark’s Tree Service is a family owned and operated business that has proudly served customers across the Capital Region for more than 25 years. We run our business on the values of personal service, fair prices and outstanding results. We take pride in the customer satisfaction that we earn, every step of the way. We offer tree removal, tree trimming, tree shaping, tree pruning, bark mulch, stump grinding, firewood, roof and snow removal. You can count on us to always offer friendly, personable and professional services. When we come to your home or business, we always offer free estimates.